It took 6 long years for the BBWAA to do the right thing. On January 7, 2003 Gary was elected to the National Baseball Hall of Fame!! Gary, your dedication, drive and how you played the game made you a player very much deserving of this honor. As a voice of many fans I say thank you for the memories and CONGRATS on this day. I'll see you at Cooperstown!! Click here for my review of the 3 Gary Carter Hall of Fame inductions that I was lucky to attend!!! The reason these cards have chunks taken out of them is to show an example of a unique contest. Click on the images to the right or left and check out my contest where you can win some of my Gary Carter related stuff!!!! YES ODD STUFF ~ Click on the above image and you now can check out some of Gary's odder cards/stuff! Have You Seen the New Cards Issued of Gary? Since Y2K there have been over 150+ (and climbing) standard cards issued! Click on the image above (or click here) to see most of them. 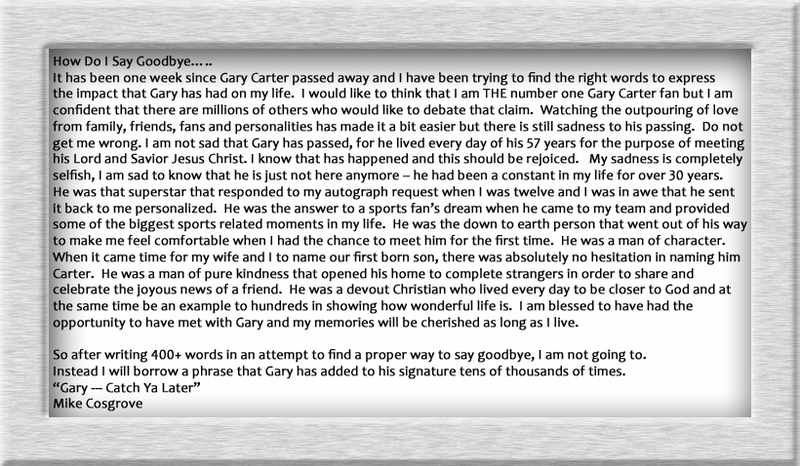 Click HERE for Magazine articles on this site and my Gary Carter collection!!! and contact me if you have any cards for sale or trade. I need some Help in my never ending search for ticket/stubs for games that Gary has hit a Homerun. Please click * HERE * for a page that will list every game. Click here to go to the Polling Page!